Webindia Review 2019: Is Webindia a Good Hosting? Web hosting provider Webindia has offices in both India and the United States. This company provides cloud computing, managed hosting, and web design solutions for businesses in India and elsewhere. Webindia is a cloud computing and managed hosting provider with a significant presence in India and the United States. This vendor’s web hosting solutions include shared hosting, dedicated hosting, and virtual servers. They also offer other services including IT services, web design, and software consultancy to companies in various countries. WebIndia has partnered with some of the leading data center companies in India and the U.S. to provide clients with reliable, highly secure and redundant data center infrastructure. These data centers are equipped with top-notch hosting hardware, have fully integrated uninterruptible power supplies, and fool-proof security measures. They use IBM and Intel servers with high-end multiprocessors for high performance and stability. WebIndia offers an array of managed cloud hosting solutions, including virtual servers, bare metal servers, and private cloud. Their managed hosting services don’t require system administrators to maintain server functionality, and they pride themselves on being a one-stop-shop for cloud computing services. They also provide a CRM implementation and app development support to their clients, not to mention CMS solutions (such as WordPress, Drupal, and Joomla) and automated data backup services. Since Webindia doesn’t display prices on its website, it’s hard to compare this company with its competitors. You have to contact them to find out how much their services will cost you. That said, their plans are feature-rich, and they provide high availability with a 99.9995% uptime network guarantee, although there is no money-back guarantee or any other refund policies for their services. You can contact Webindia’s 24/7 support team via their email address(es), their ticketing system, or via their U.S. and Indian telephone numbers, but there is no live chat. The highly-responsive support team is also professional and polite. They always go the extra mile to assist with your hosting issues, which is good because there is no knowledge base to help you help yourself. Webindia undoubtedly provides quality hosting solutions to small and medium-sized business enterprises. However, they’re not exactly transparent when it comes to pricing, so potential customers need to contact them and then do a lot of legwork to compare against the competition. 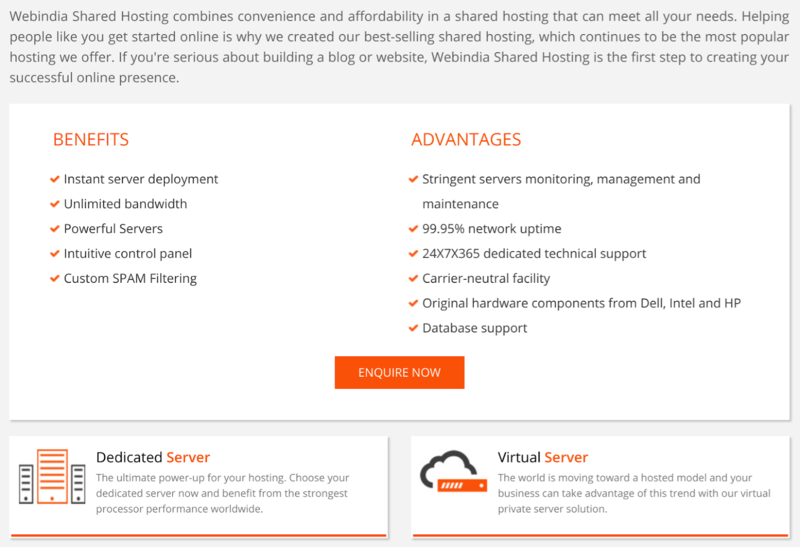 Wondering how Webindia stacks up against other Web Hosting companies? Enter any other Web Hosting company and we will give you a side-by-side comparison.